Although the Berlin Heart EXCOR pediatric ventricular assist device has greatly improved the management of pediatric patients with severe heart failure, its application is strictly limited in Japan, with only six institutes given the permission of implantation of the device. Therefore, alternative types of mechanical circulatory support are indispensable in case of acute circulatory failure in such patients. Veno-arterial extracorporeal membrane oxygenation (VA-ECMO) is the preferred choice for first-line support, while their safe duration is relatively short. 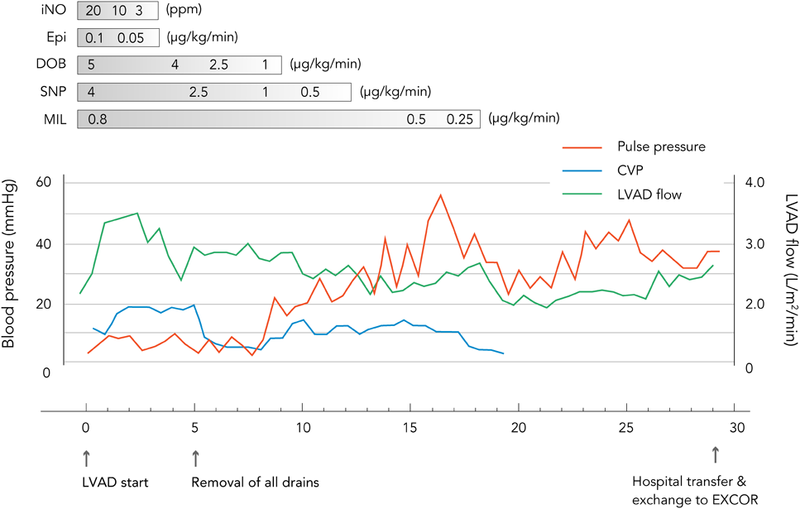 The short-term continuous-flow ventricular assist device (STCF-VAD) not only allows longer management than VA-ECMO, but also serves as a bridge to more durable device. We experienced successful management of STCF-VAD for about one month in a pediatric patient with dilated cardiomyopathy (DCM). There are only a few reports describing clinical experiences of STCF-VAD in Japan,1) and the reported results are not satisfactory mainly due to high incidence of complication such as major bleeding, neurological disorder, and infection. Herein, we describe our experience focusing on prevention of complications and the safe management of STCF-VAD. A seven-month-old previously healthy boy was transferred to our hospital with acute circulatory collapse due to severe heart failure. VA-ECMO support was immediately commenced via the right cervical approach, and then he was diagnosed with DCM. After 12 days of support, he was recovered and weaned from the VA-ECMO. Consultation with the University of Tokyo Hospital, which is one of the four facilities in Japan certified for pediatric heart transplant, indicated that he was a candidate for heart transplant. Although rigorous medical therapy was initiated, he developed circulatory collapse requiring cardiopulmonary resuscitation when he was eleven months old and VA-ECMO support was emergently established again via a median sternotomy. Conversion to the EXCOR was not indicated at this point because of two concerns that might have led him out of indication of heart transplant: possibility of neurological deficits following cardiopulmonary resuscitation and severe respiratory failure due to left bronchial obstruction secondary to compression by the dilated heart. Hence, we decided to assess his condition and judge the indication for heart transplant after converting to the STCF-VAD. After 24 days of VA-ECMO support which was spent for neurological assessment, preparation of devices for the STCF-VAD, and inspection tour to University of Tokyo Hospital by our team, surgery was undertaken to convert to STCF-VAD when he was twelve months old and his body weight was 7.1 kg. Via a median approach, the VA-ECMO was removed after establishment of cardiopulmonary bypass and a 6-mm straight EXCOR Apex cannula (C18A-020; Berlin Heart AG, Berlin, Germany) was inserted into the apex of the left ventricle. A 10-mm expanded polytetrafluoroethylene graft (STRETCH Vascular Graft, W.L. Gore & Associates, Inc., Flagstaff, AZ, USA) was anastomosed in an end-to-side fashion to the ascending aorta, following which a 6-mm angled EXCOR Arterial cannula (C80G-021; Berlin Heart AG, Berlin, Germany) was inserted into the graft. The distal ends of the two cannulae were led outside the body through the rectus sheath and connected to the circuit of STCF-VAD. Our original STCF-VAD system consists of a ROTAFLOW centrifugal pump (BO-RF32; Maque, Rastatt, Germany) and a polyvinylchloride circuit with the T-NCVC® heparin coating (National Cardiovascular Center and TOYOBO, Osaka, Japan).2) Following the administration of catecholamines and inhaled nitric oxide (iNO) as support for the right ventricle (RV), weaning from cardiopulmonary bypass and conversion to STCF-VAD was performed uneventfully. The patient’s postoperative course was stable. Administration of iNO and catecholamine were terminated in postoperative day three and nine, respectively (Fig. 1). Unfractionated heparin (UFH) administration was started 12 hours after operation, targeting an activated partial thromboplastin time of 40–60 seconds. Aspirin (5 mg/kg/day) and dipyridamole (4 mg/kg/day) were administered from day three and four of STCF-VAD support, respectively. 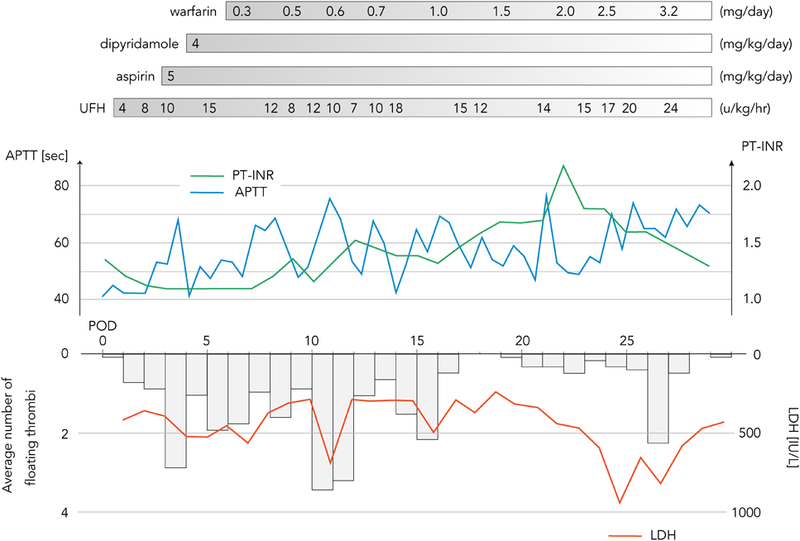 Warfarinization was started on day six, targeting a prothrombin time international normalized ratio (PT-INR) between 2.5 and 3.0, and was accompanied by UFH administration until the warfarin dose reached a therapeutic range (Fig. 2). Although a total of six circuit exchanges were required due to thrombus formation, there were no neurological complications, no hemorrhagic events, and no major infections throughout the clinical course. Intravenous injection of sedative drugs were ceased by the day 13 of STCF-VAD support, and since then, small dosage of internally administrated phenobalbital and chlorpromazine were enough for safe management of the patient in the intensive care unit. Electroencephalograph finding was normal and the Glasgow coma scale of the patient was E4VTM4 without any paralysis. In addition, respiratory function was sufficient for extubation. Then, conversion to the EXCOR was indicated. The patient was transferred to the University of Tokyo Hospital after 29 days of STCF-VAD support, and on the same day the extracorporeal drive unit was changed from the centrifugal pump to the EXCOR. After 9 months of EXCOR support, he underwent heart transplant at the same hospital when he was one year and eleven months old and his body weight was 11.8 kg, and was back to home in stable condition about two months after operation. Along with the increasing use of the EXCOR, STCF-VAD has gained importance in the management strategy of severe heart failure in pediatric patients. STCF-VAD is more advantageous than VA-ECMO in that it enables longer continuation and more efficient volume unloading of the left ventricle. In addition, as patients on VA-ECMO support are thought to be at risk of postoperative RV failure after LVAD implantation,3) it is worthwhile to assess RV function and judge the indications of LVAD implantation after conversion to STCF-VAD. From the reported results, 65–71% of patients who underwent STCF-VAD support subsequently had positive courses, such as recovery, heart transplant, or conversion to durable VAD devices.4, 5) Morbidity due to major adverse events was reported as follows: major bleeding in 24–29%, neurological disorders in 15–24%, and infections in 17%,4, 5) with the median duration of the STCF-VAD support in 12–15 days. Prevention of these adverse events is essential for improving the outcomes of STCF-VAD management. Thromboembolic stroke and intracranial hemorrhage are two major causes of the neurological disorders. UFH, aspirin, dipyridamole, and warfarin were included in antithrombotic therapy for STCF-VAD, referring to the Edmonton antithrombotic guidelines for the EXCOR.6) UFH administration is recommended to started at least 24 hours after operation in the current guidelines,7) although we had to start it 12 hours after operation due to early thrombus formation within the circuit. From our experience, a low PT-INR (<1.5) seems to be relevant to thrombus formation within the circuit (Fig. 2). Assessment of aspirin resistance and necessary increase in the dose should be taken into consideration in case of recurrent thrombus formation.7, 8) As for hemorrhagic complications, complete reversal of UFH and strict control of blood pressure (targeted mean BP <70 mmHg) are thought to be important in the early postoperative period.9) Mean blood pressure also should be controlled above 50 mmHg to maintain adequate perfusion of vital organs. The components of the STCF-VAD circuit could be a potential source of thrombogenesis. Daily observation indicated that mobile thrombi tended to be formed on the infusion side of the circuit rather than the drainage side, while they were scarcely found in the centrifugal pump (Fig. 3), as a previous study has already reported.5) Compared with pulsatile flow, continuous flow has been shown to have a tendency for stagnation of blood flow at sites of abrupt enlargement of flow caliber.13) Therefore, the circuit must be designed with as less caliber changes as possible. 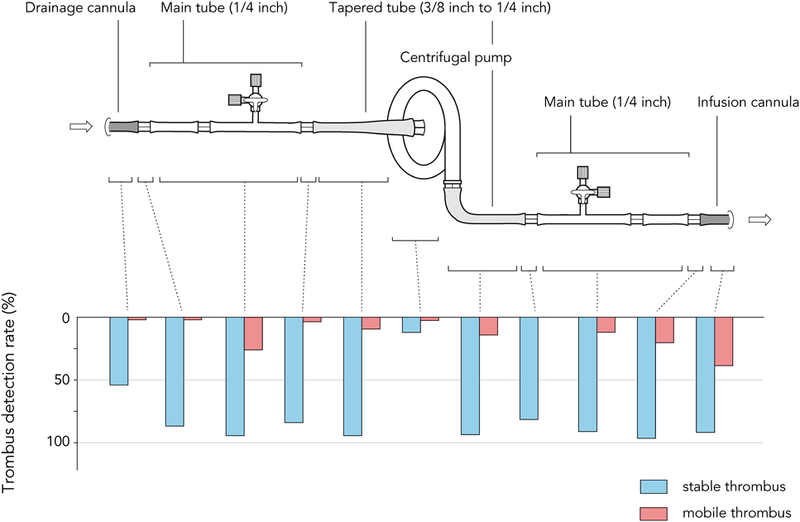 The centrifugal pump, which has connecting ports with diameter of 10 mm, was connected to the main tube with diameter of 6 mm via a tapering tube to create a gradual change in caliber. In addition, we adopted the percutaneous cannulae exclusively for the EXCOR with the permission by both the ethics board of our institute and the Japanese Association for Clinical Ventricular Assist Systems (JACVAS). In the application for JACVAS, no additional qualification was required on the condition that implantation of the cannulae should be performed under the instruction of the staff of University of Tokyo Hospital. Except for the concern about the high cost which was necessitated due to out of insurance support, application of the EXCOR cannulae was thought to be advantageous not only because they might be less thrombogenic than other cannulae for cardiopulmonary bypass which were not designed for a log time of use, but also because it enables transition to the EXCOR without re-open chest surgery. Management of STCF-VAD flow was based on the concept that cardiac output is regulated primarily by the RV function and VAD flow must be adjusted to it. As a daily practice, the revolutions per minute of the centrifugal pump were adjusted to keep the adequate LV volume by observing the shape of interventricular septum with echocardiography. In addition, central venous pressure was thought to be the most relevant parameter of RV function. During the early postoperative period, catecholamines and iNO were administered not only to prevent RV failure, but also to achieve maximum RV output to keep the STCF-VAD flow high, with the intention of supporting visceral recovery and reducing the risk of thrombus formation (Fig. 1). After the acute period, flow was gradually decreased along with tapering of RV support. The STCF-VAD should be converted to the EXCOR as soon as possible because of it's high incidence of complication. Although we have confirmed the will of parents for heart transplant in advance, 29 days of STCF-VAD management was necessary in the present case mainly to wait the decision-making of parents to implant the EXCOR. In this process, discussion between parents and the pediatrician of University of Tokyo Hospital who specializes heart transplant was thought to be crucial to relieve the anxiety of the parents and to confirm their decision. Thus it can be said that one key to prevent the lengthening of STCF-VAD management is frequent and enough explanation to the parents by the expert of heart transplant. As the STCF-VAD therapy requires highly strict management, it should be managed in institutes with enough experience of ECMO therapy and by an experienced medical team which consists of intensive care doctors and nurses, clinical engineers, cardiovascular surgeons, and infection control doctors. Far more clinical experience and improvement in the devices are necessary to improve the clinical outcomes of the STCF-VAD. The authors are grateful to Dr. Yasutaka Hirata (Department of Cardiovascular Surgery, University of Tokyo) for so many valuable instructions and advice.